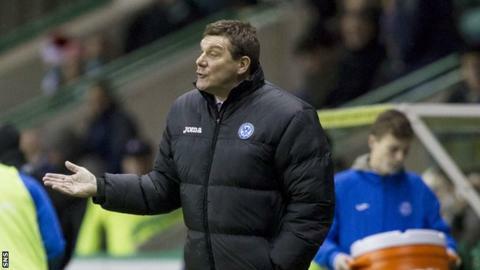 Manager Tommy Wright hailed a "magnificent point" after St Johnstone played out a 0-0 draw with 10 men at Easter Road. Patrick Cregg was sent off on 30 minutes but Hibernian could not break down the well-organised visitors. "I'm delighted with their character and attitude after going down to 10 men," said Wright. "I could never doubt the players' honesty and we kept going right to the end." The draw keeps sixth-placed St Johnstone four points ahead of Hibs with a game in hand. Saints soaked up a lot of second-half pressure without too much difficulty although it took a great injury-time save from Alan Mannus to keep out a flashing header from James Collins. "To play for an hour away from home with only 10 men is always difficult but I thought we limited them to very few chances," explained Wright. "What a save it was but Alan has only had one difficult save to make." Cregg's dismissal for a foul on Paul Cairney came after a drab opening and Wright thought the red card was fair. "My initial reaction was that we can have no complaints," he said. "Ten years ago, it probably isn't even a yellow," he said. "But that's where we are and he was slightly over the ball. I thought it was a red at the time. "I just felt there was a foul on Frazer Wright just before it and if the referee sees that then we get away with it." It is the second game in a row that a Saints player has been sent off immediately after coming off the bench following Rory Fallon's rush of blood against Aberdeen. "Rory's was just silly and he's been told that," continued Wright. "Paddy is there to win the ball and win tackles an he's just on. "He was a split second late. There was no malice in it." While Wright was delighted with his side's defensive application in the second half, he was less than pleased with the way the Perth side had started in the Edinburgh rain. "I wasn't happy with the first 30 minutes," he said. "I couldn't really see that coming. We were miles off it and second to everything. "It probably took the sending off to give us a bit of a gee up. "We had to change our shape to get back into the game and we'll need to look at that but it's maybe a day for concentrating on how well we did after that."